Have you seen or read The Grinch? Seems the right thing to talk about this story as we’re heading deeper into Christmas time. Please be patient with me if you know the plot while I explain how it feels to me like a story of community. The young female character, Cindy-Lou Who, has some questions about the festive season (which doesn’t feel very festive to her). Why all the rushing around buying stuff? Where’s the love and time to be together? She also has some questions about The Grinch, this apparently monstrous green dude who lives on the mountain top outside their village of Whoville. Why is he there, alone, and not with the rest of them? It’s tough for Cindy-Lou to apparently be the only person with these questions. She feels confused and alone. But she persists with her investigations. She wants The Grinch to be part of the village again. And she wants Christmas to be about community. Slowly, she grows support for her cause until most of Whoville realises that Cindy-Lou Who was right all along. The Grinch is green? So what! They get to know him, and he’s really nice. He fled all those years ago because the town bully scared him away. Now, the bully gets a dose of karma, and the village is united, not in shiny packages, but in shared values, support and love. The Grinch, who had become convinced being alone was the best way of life after escaping to the mountaintop, warms and develops in the presence of this new welcome. By connecting with others, his heart literally grows and expands, from being two sizes too small, to a size capable of giving and receiving love. 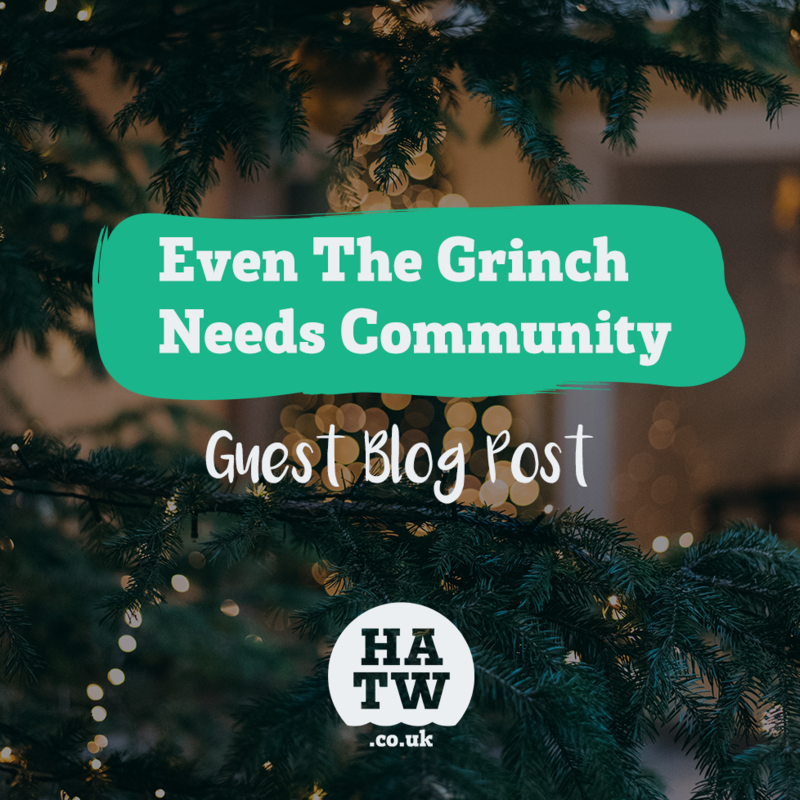 So, this is how Cindy-Lou Who, the town of Whoville and The Grinch make their lives better through community. Maybe one of the reasons this is my favourite Christmas film, is I relate to Cindy-Lou. She feels like an outsider, like the only person who thinks in the way she does, and experiences life as she does. Big parties are not my thing. I’m an introvert, and I generally prefer to stay in to read a book, watch a film, or have a chat with one or two friends. I have two chronic illnesses: crohn’s disease and endometriosis. Making art, and writing are two of the things that make me happiest. My skin is decorated in a growing number of tattoos. Why am I talking about being an outsider in a blog post about community? Well sometimes it’s through those things that make us feel different, where we find our communities. The definition of community is not just a shared place, it is about shared attitude. My main place of community isn’t in the small village where I grew up. Sometimes I get the warm fuzzies when I head back there and connect with a friend or family member or visit somewhere that brings back a good memory. But I haven’t found my community in the same way as Cindy-Lou Who, around a giant Christmas Tree. Should I look on Google Maps? Nah. Maybe one day that’ll work. But for now we can look online, or right in front of our noses. Who makes us feel positive about life? Who is supportive? Who do we feel understands us? Do we have stuff in common with particular people? A key for me was being open, and when I felt comfortable, having honest conversations with new friends, with people I met at work, college, uni, or on social media. Maybe you’re a part of one big group of friends and that’s your community? Or maybe you’re like me and are part of separate communities. Over time, I’ve met people who have some of the same things going on as I do, and my communities keep growing. My mind was blown after reading a book called ‘Quiet’ by Susan Cain. I realised there was a name for my quietness – introversion – AND THERE WERE OTHER PEOPLE LIKE ME! Other people have cheeks that blush all the time! Other people need alone time to recharge! There are other people who fear public speaking above any horror film! They were all like meeeeee! I felt massive relief from this. And when I started talking about the book, probably with blushing cheeks at first, I found some friends who feel the same. Thank you, Universe! We can talk about this stuff and it doesn’t feel weird because we understand each other. Now, together we can dodge big parties to drink tea and eat pizza at home. That is our kind of party. When I adopted William the rescue sausage, I gained a new community. We’re members of Borrow My Doggy, where he sometimes gets looked after by kind borrowers when I’m in work or college. We’ve met dog sitters on Dog Buddy, and I’ve become a dog sitter on weekends. We’ve been on South Wales sausage dog walks, where he’s met other sausages of all shapes and sizes. I’ve made new friends who also have dogs and met up more with old friends who’ve become doggo parents. I meet new people in the park all the time. There’s always someone to ask for dog related advice, and somebody to go for a walk with. Life in our house has been made better with our community of dog pals. These days, sometimes I walk down the street, and people shout, “William!” He has his own friends who don’t even know me. Almost whatever you’re into, we can find a supportive community who’ll get us. I post on Instagram every time I’m in hospital getting a new infusion of meds for crohn’s disease. By doing this, I’ve met people online who also have the illness, and I try not to be shy and speak to other patients in real life at the infusion room too. Now I’m working on an art project where I make stuff about my experiences. Chronic illness can be rough – it’s much better to have people to talk to about this, instead of going it alone. I’ve joined a foundation course in art at college – instant friends I can share my art with all day long! I’ve been writing for a while and there are so many friendly writers and groups around, whether on Twitter or in person, like Roath Writers which my friend Christina runs. None of the people around me had tattoos when I got my first large piece. I had the heebie jeebies. Did I do the right thing? Would I hate it in two weeks? Someone asked, “What are you going to do on your wedding day?” What a question. So I started a project where I interview other women with tattoos. They say, if they choose to have a wedding day, they will look awesome, with their lush tattoos proudly visible. Now I have a lot more. Our communities can be who we want them to be. We don’t all need to have shared things in common to be a community, apart from mutual support and niceness. The key to opening up our communities is talking. Talking is not weakness. Whatever we’re feeling, somebody else has felt it, or is feeling it too. Even though I like to spend lots of time alone, I know that my communities help me to be a part of something bigger, and therefore stronger. Sometimes I get into a feeling where I want to spend every minute alone. But by making an effort to reach out to my communities, to be a good member and be there for other people too, I am pushing away that urge to hide. I don’t want my heart to shrivel up like The Grinch’s and get too sizes too small. And like Cindy-Lou Who, I want to be persistent, to do the best thing for my mental health, to keep growing, and to keep looking for my community members. I hope you reach out to yours in this hectic festive season, they may need you as much as you need them. Happy Christmas one and all.